The House will be debating HB 2, the property tax reform bill tomorrow on the House Floor. I have filed several amendments for targeted property tax relief. Current law imposes a substantial penalty on landowners when they decide to change the use of his or her land from agricultural uses to something else. A “rollback rate” or what I would refer to as a clawback tax is imposed where a landowner must pay local taxing entities 5 year clawback on the market value of the property as if it never held an agricultural exemption plus 7 percent compounded interest. This clawback tax substantially hinders your property rights and there is simply no justification for this excessive penalty that prevents properties from advancing to their highest and best use. I will be running with a few amendments tomorrow that are aimed at substantially reducing the clawback penalty. Over the years I have heard stories from constituents where they have gone through the process to protest their appraisal, win and the next year it goes right back up with little explanation. This is very frustrating and discouraging process to participate in over time. This amendment makes a minor change that in the following tax year where the taxpayer is successful in appealing their protest that the increase presented by the appraiser must be supported by clear and convincing evidence. This is a simple yet profound change so that taxpayers don’t feel like they are wasting their time getting involved in the process. The House passed HB 347 to protect the property rights of all Texans. I am proud to have authored HB 347 which will finally end forced annexation in Texas and will give all citizens a say in future annexations. Thank you to the residents of Parker and Wise county who supported ending forced annexation and helped me move this legislation through the House. Senator Birdwell will now carry this important piece of legislation through the Senate and we look forward to Governor Abbott signing this critical property rights protection in the near future. See article in the Weatherford Democrat HERE. Last week I was proud to support schools, students, and teachers by voting for HB 3. HB 3 is a comprehensive plan to reform school finance in the state of Texas. Through the budget and HB 3 we are lowering school district property taxes by an average of 5.5% statewide and every Texan will see a permanent property tax rate reduction. HB 3 reduces the “robin hood” burden by more than $3.5 billion over the next two years and reduces recapture by increasing the amount of money guaranteed for each student. HB 3 provides incentive-based increases to teacher pay, more continuing education and training opportunities to teachers throughout their careers, and funding for professional development programs that train teachers. HB 3 gives local school districts more discretion to determine teacher and school support staff compensation how they see fit. Additionally, HB 3 will provide funding to ensure every student receives the help and services they need. The budget and school finance reform bills are now in the Senate and we look forward to seeing what the final version of these bills will look like. Both chambers are committed to school finance and property tax reform. I had the pleasure of meeting with the retired teachers of District 61. The Texas legislature is working hard to put TRS on a path to actuarial soundness by increasing the pension rate and providing a 13th check for retirees. 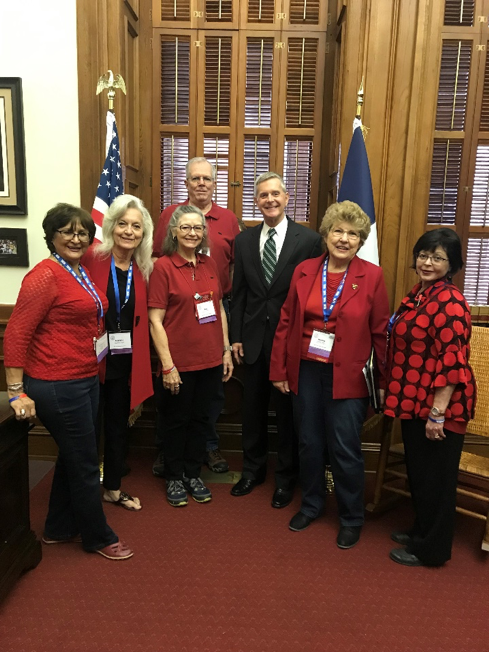 It is important to support our retired teachers and I will continue to work to ensure our retired teachers our supported in Texas.